When you think of rehearsal etiquette, what comes to mind? Is it discipline? Is it procedural? Is it behavioral? It is certainly all of the above! As conductors, we have an image in our minds of what makes a great rehearsal and how we imagine our students acting during this ideal session. Have you expressed these expectations to your students? Much is written in our teaching literature that focuses on what we can do as a teacher/conductor to elicit a great rehearsal from the students. Peter Boonshaft devoted a good portion of his wonderful book “Teaching Music with Passion” to the subject (especially his chapter called “The 33 P’s of a Wonderful Rehearsal”) as did Ed Lisk in his important text “The Creative Director – Conductor, Teacher, Leader.” These books are step one in the process and will go a long way toward helping you structure your rehearsals for success. The next step however, is to teach the students your rehearsal expectations. I believe that you must tell them every single detail of what envision to be a great rehearsal, from how they enter the room to how they leave after it is over. This, of course, is based upon your teaching style, personality and philosophy. Some people want their rehearsals to be completely quiet and intense at all times, others have a more relaxed style. Neither is more effective than the other necessarily, just different. I personally feel that rehearsals need to have highs and lows. Points of high intensity and focus, and other points when you let the students relax a bit and bask in the glory of a goal achieved. Sometimes for me, a well-timed joke can make all the difference in making the rest of the rehearsal a success. However, I was one of those teachers who did not want chaos at the beginning of rehearsal. I expected students to set up their places, get their music, chair, stand, and assemble their instrument as quietly as possible, then wait for me to give the downbeat for the first note. I found that if quality was established from the very first note, then I had a better chance for the whole rehearsal to be executed well. Besides determining what type behavior or intensity you expect, explain to them how you want to practice things, how you want them to remember things they’ve learned. Explain why you keep saying “one more time” thirty more times – and ways they can avoid that in the future! You should even explain to them how you would like them to mark their music with a pencil. 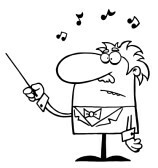 Some students really do not know how to mark their music effectively so that they will be able to decipher it the next time they play the piece. The most important thing in a rehearsal is to have a plan, be prepared, and then set expectations for the students that are clearly communicated to them, so they know what you expect and will feel a sense of accomplishment when they meet those expectations. If they do, I encourage you to reward them with praise for a job well done. Reinforcing positive behavior and actions has been proven to effect future behavior substantially more than no reinforcement or negative reinforcement. Expect their best by giving your best, and thank them for doing so!